Coming home to this mess was an eye opening experience for some neighbors. 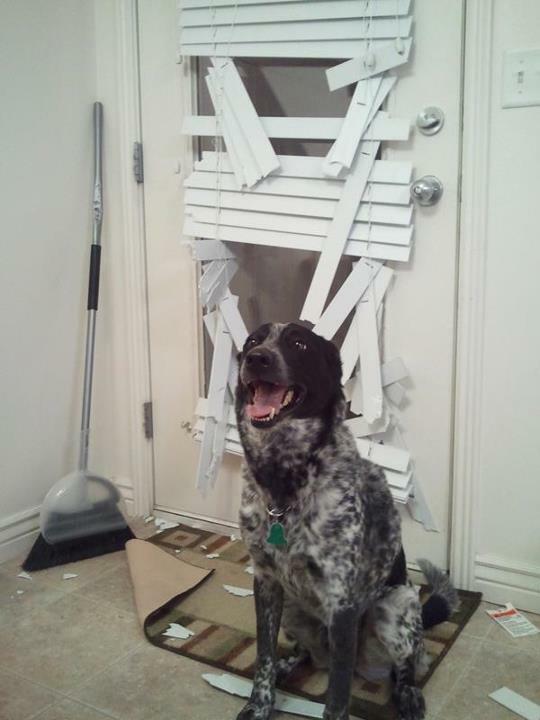 Their dog apparently had a hard time seeing through the blinds outside and decided to take matters into his own hands. Every wonder just exactly what he was thinking? We all were wondering the same thing, and wondering how long it took him until he was satisfied with his view. Notice he is not too concerned about hiding his behavior ..he just wanted to see outside. Well…time for some new window treatments….maybe a Roman shade that pulls up and down. What kind of treatment would you suggest here?